Ironing the wearable may feel like extra works to many, but is a necessity in reality. So, one should focus on making it easier, rather than being worried. In this context, the first thing one should do is to have an ironing board of good quality. There are so many varieties of ironing boards available these days. Ironing boards are generally the flat surfaces, on which the dresses have to be pressed. It is recommended to cover the ironing board with a nice heat resistance fabric. In general, the pads do come with vents; those let the steam generated through irons to go through the clothes and get away through the bottom end. One can find several distinguishing features through advanced ironing boards. These features are meant to make the process of ironing way lot easier. For example, the advanced ironing boards do come with sleeves of around 60 cm long and around 15 cm wide, joined with the board to iron the sleeves and other tinier sections of dresses. Similarly, iron-rest is another incredible feature that comes with the modern day ironing boards. It can be found at the bottom of the boards, and are made up of heat resistive materials. Iron rests are generally bigger to grip the iron strongly for a greater level of security or to ensure it doesn’t fall. Primarily, one can find portable ironing boards, table-top ironing boards, and wall fixed ironing boards. All these three varieties have their own positive and negative sides. One should consider the aspects like the frequency of its usage, the place where it has to be kept and the available space there for it, the price, etc. 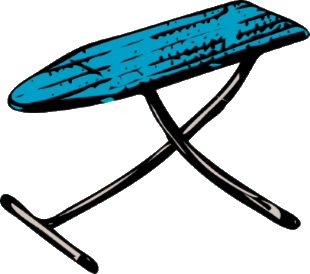 Most of the contemporary families prefer having portable ironing boards at their homes. These boards can be distinguished from the others regarding their stretchable legs, which can be folded when not in use. One can easily take these boards from one place to the other as per the requirement. The other benefit of the portable ironing board is the height adjustment feature. This feature allows a person to press both while standing as well as while sitting. However, the disadvantage associated with these portable boards is the complexity associated with its set-up. Coming to table-top ironing boards, these often come with comparatively smaller legs. Designs of these boards are meant for easy set-up. One can easily carry it and set in a comparatively narrow place as well. This is the reason that these ironing boards are so much popular among the students. Talking about disadvantage, its smaller size doesn’t make it a suitable for placing bigger things or larger clothes on it. This makes things difficult while pressing the sleeves or smaller sections of the shirts. The other ironing boards are those fixed on the wall. These can be removed and kept folded when not in use. The feature of wall fixing makes it popular among the contemporary families, those live at comparatively smaller houses. In fact, these can be fixed within a closet as well. Modern day families have started going with this wall fixed ironing boards, irrespective of their room sizes. Folding the entire board after usage takes only a couple of minutes. Similarly, setting it up for usage is also a matter of few minutes. This feature makes it a perfect recommendation for the modern day busy families. Comparing endurance, wall fixed ironing boards can indeed be the better choices in comparison with the others. These ironing boards are way stronger, promising greater longevity. If the passage area is narrower, the wall mounted ironing boards can be adjusted to enter at a specific angle and be placed at a suitable place inside. These boards are manufactured in a way so that any common man can find it easier for installation. One doesn’t need to take help of any technician for the installation of wall fixed ironing boards. It depends upon the room size of the concerned person. If the size of the room is big, the best recommendation would be going with the widest option. Naturally, it makes the process of ironing easier. One can properly find the wrinkles or folds on the clothes when these are spread over a wider surface. It is recommended to decide about the dimension of the board before going for it. Height is a crucial factor while buying an ironing board. It is highly advised for the buyers to go with ironing boards with height adjustment feature. It has been seen in many occasions that people get back to ironing on the floors due to the issues of ironing board height adjustment. It is impossible for every member in a family to be of the same height. Naturally, an ironing board of fixed height can’t be suitable for everyone. In other words, there is no other option remained but to go with the ironing board with height adjustment feature. If you are going with a portable ironing board, the best recommendation would be going with the one that is lighter in weight. It’s a misconception among many that the lighter ones are not the sturdiest ones. However, it’s a fact that an ironing board can be made both lightweight and strong using the best quality material. It can be dangerous for children to come to cross with irons. There remains every chance of an accident if children get along with this equipment, especially when there is no one around. First of all, it is advised to keep the ironing board in a secure place. You should make the child cautious by educating them about the possible threats. Children should not be allowed to use these things by themselves without proper training. Moreover, they should be given proper safety training prior usage. Best suggestion would be to remain present initially when the children do use these things.